From Yosemite to Glacier, there are many spectacular national parks in North America, especially out west. In addition to the natural splendor, many park visitors have also been captivated by the rustic mountain architecture of the national park service, otherwise known as Parkitecture. These buildings appear to be extensions of the very locations on which they stand. The over sized boulders that make up their foundations seem to have been quarried from the nearby cliffs. The old growth rough hewn timbers bearing their walls and roofs appear to have materialized from the adjacent forests. Parkitecture draws from craftsman, Swiss chalets, Adirondack, and other vernacular forms of architecture, and is considered to be one of the early versions of today’s Mountain Architecture. 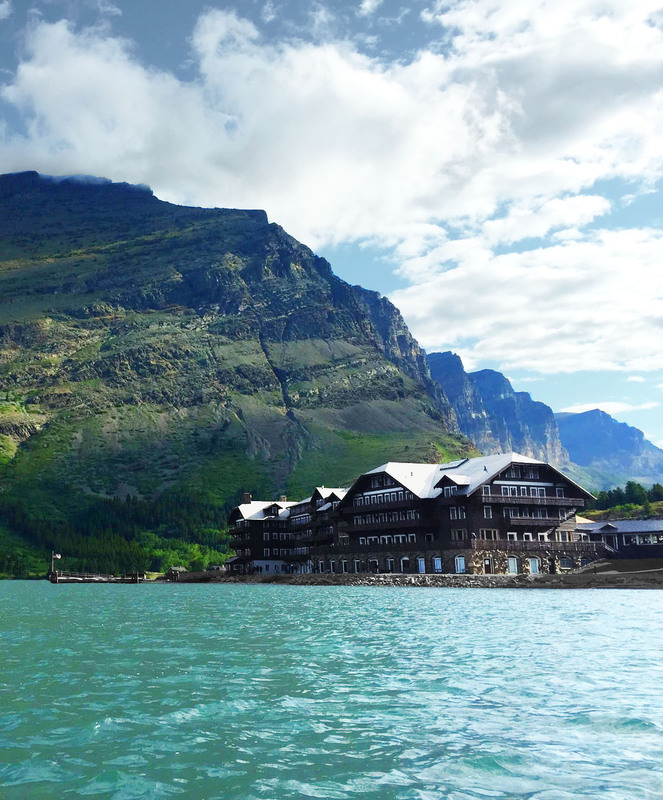 Many Glacier Lodge in Glacier National Park located on Swiftcurrent Lake with Mt. Grinnell Beyond. This alpine lodge is a fine example of both parkitecture and mountain architecture. Also known as “National Park Service rustic”, there are many building types that exhibit parkitecture, ranging from museums, park headquarters, ranger’s cabins, vista houses, and lodges. While known for their rustic appearance, these mountain lodges in many respects are far from primitive. They feature grand halls with massive fireplaces, decks and large windows with sweeping views, and fine dining halls. At the beginning, during the era of the railways, these mountain lodges were catered to the elite who accessed the parks via trains. Glacier, the Grand Canyon, and Yellowstone National Parks, specifically, were developed by railway companies. They provided a European traveling experience without need of a 5 – 9 day journey on an ocean liner. Glacier National Park (in northwestern Montana), and its mountain architecture, was marketed by the Great Northern Railway as America’s Alps or the Switzerland of North America. The parkitecture style developed as the national parks grew. Mountain architects such as Gilbert Underwood, Robert Reamer, and Mary Colter all left major contributions to the style. As both an architect and public administrator, Herbert Maier also left a significant impact, often with funding from the Rockefeller Foundation. 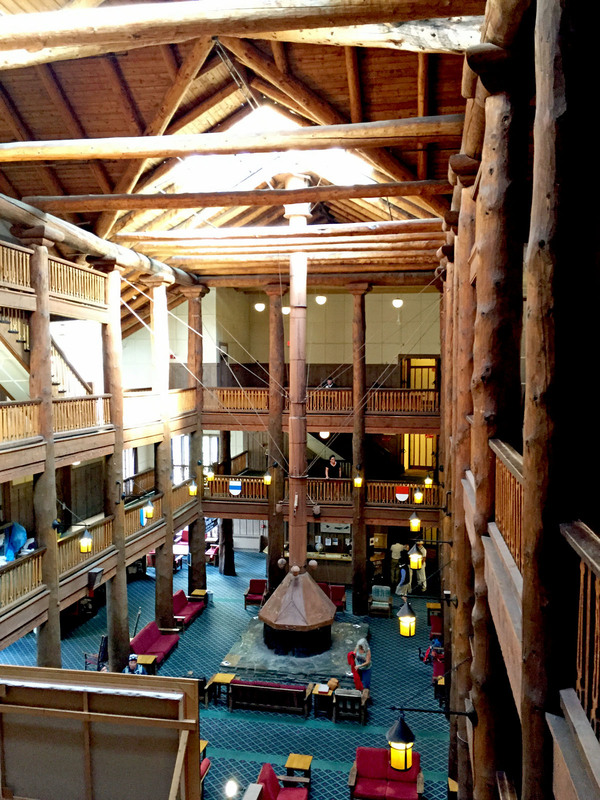 The Old Faithful Inn, located in Yellowstone National Park in Wyoming, is the largest log structure in the world. 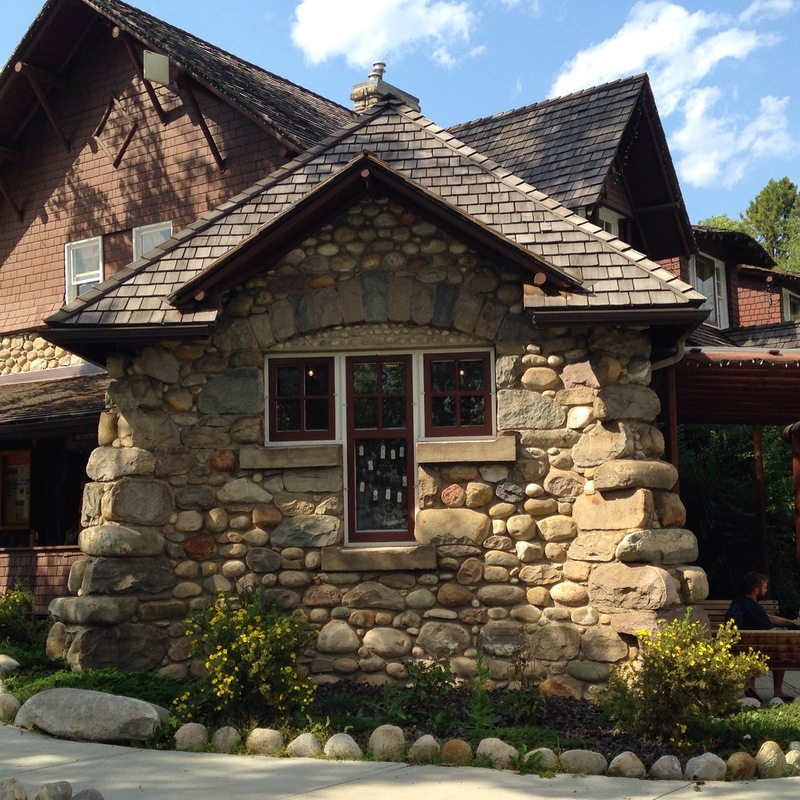 Designed by Robert Reamer, it was built in 1904 with local, natural materials, including lodge-pole pine logs. The inn is considered the first of the great park lodges in western America, and is situated such that when visitors arrive they can see directly towards the Old Faithful geyser. Once inside they’re greeted by a towering lobby with a massive stone fireplace and log trusses. During the Great Depression, president Franklin D. Roosevelt sought to provide work for the unemployed via the Civilian Conservation Corps (CCC). This resulted in the construction of many parkitecture buildings such as the Silver Falls Lodge, the Mt. Spokane Vista House, and most notably Timberline Lodge on Mt. Hood. The Silver Falls Lodge in Oregon. Built by the Civilian Conservation Corps. The Vista House at Mt. Spokane State Park, near Spokane, Washington. Also built by the Civilian Conservation Corps. Positioned just at the tree line’s edge on the side of Mt. Hood, Oregon’s tallest peak, is the famous Timberline Lodge. From this prime location one has a front row view of of Mt. Hood, but the view in the opposite direction is also spectacular, with views of Mt. Jefferson and other peaks. Built during the Great Depression through Roosevelt’s Works Progress Administration (WPA) this 74,000 square foot mountain lodge is no small accomplishment. The building features a large two story hexagon room in the center with a dining wing to the right and bedroom wing to the left (as viewed from the main entry side). Timberline Lodge is located on Mt. Hood with its own ski area. If it looks familiar, the exterior was used in the horror film “The Shining”. 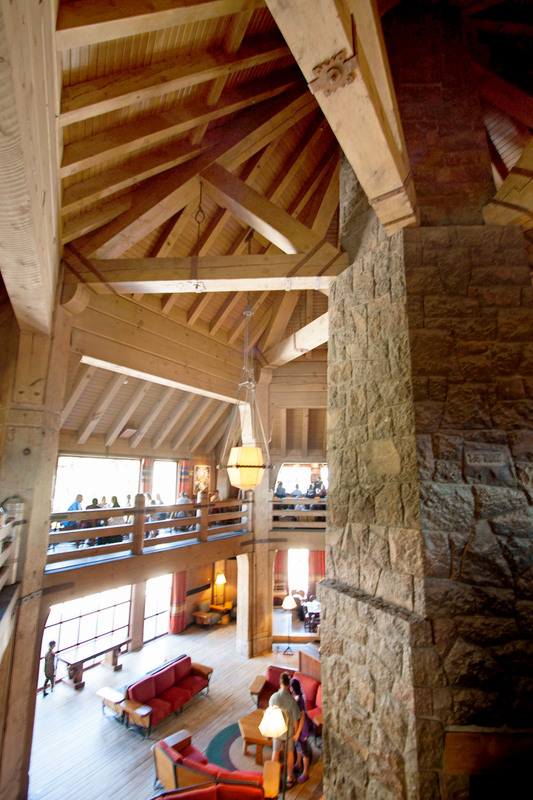 Timberline Lodge is well known for it’s rustic mountain craftsmanship. Massive timbers make up the framing in the center hall. Each newel post has a unique animal carving. The lodge’s logo, a design rooted in native american heritage, is the snow goose seen in the weather vane on top of the central chimney. In 1937 Roosevelt arrived in Oregon to dedicate the Bonneville Dam and Timberline Lodge. As the president’s forty vehicle motorcade neared Timberline, mounted Forest Service personnel lined the road to wave and salute him. After arriving he took the elevator to the main floor, came out on the terrace known today as Roosevelt Terrace, and gave a speech on the value of our national forests and the benefits that this mountain lodge would bring to many future generations. 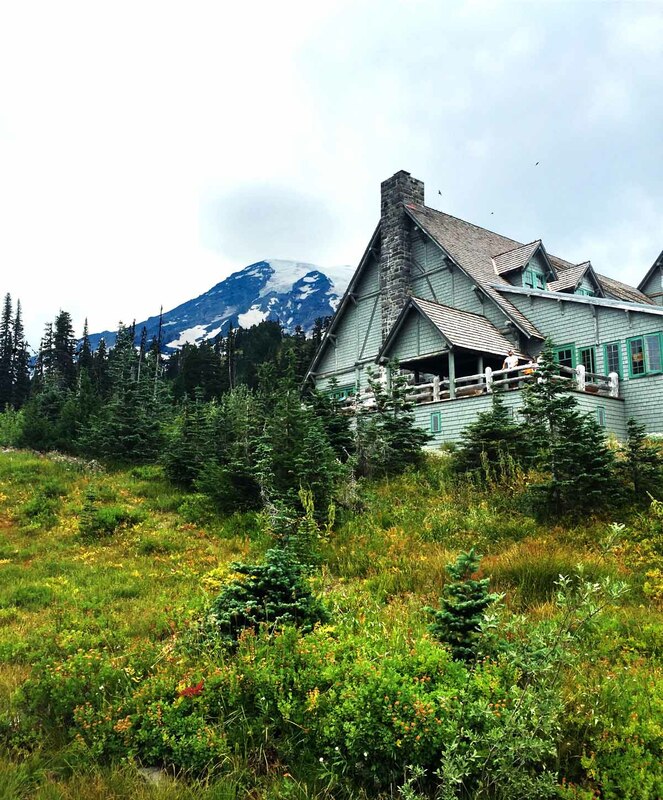 Paradise Inn was built in 1916 on the south flank of Mount Rainier, in Washington’s Mount Rainier National Park. Many climbers stay at the Inn before ascending the 14,411 foot (4,392 meters) high mountain. Native materials were used and included cedar shingles, stone and weathered timbers salvaged from an 1885 fire. Paradise Inn and the Crater Lake Lodge (in Oregon), for example, have both received extensive restorations, with most of the Crater Lake Lodge being entirely rebuilt. Yosemite’s Ahwahnee Hotel. Photo credit to Nicole, Instagram’s sanjuan_gypsySituated on the valley floor of Yosemite National Park (California), with magnificent views of the Royal Arches, Yosemite Falls, Half Dome, and Glacier Point is the Ahwahnee Hotel. 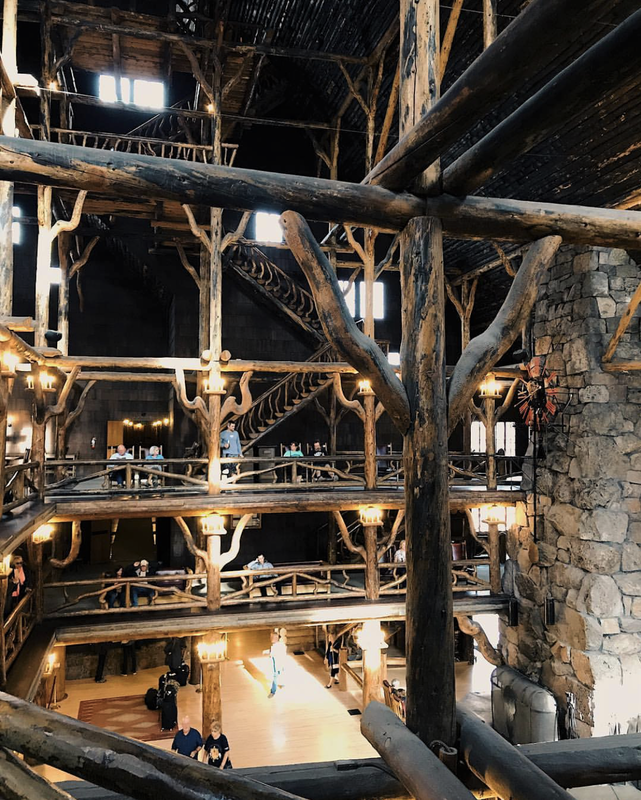 Built two decades after Yellowstone’s Old Faithful Inn, this mountain hotel was intended to be a hotel decked with the finer things in life. The Ahwahnee was the product of a group of architects, bureaucrats, visionaries, and businessmen. Stephen Mather, most well known as the first director of the National Parks Service, was the lead on this project. Mountain architect Gilbert Stanley Underwood, a graduate of Harvard, is responsible for the design. When it was built in 1926 the construction cost was $1.5 million. The hotel was recently renamed “The Majestic Yosemite Hotel” due to a disagreement with the national government and a concessions business. Mather presided when the hotel opened in July of 1926. 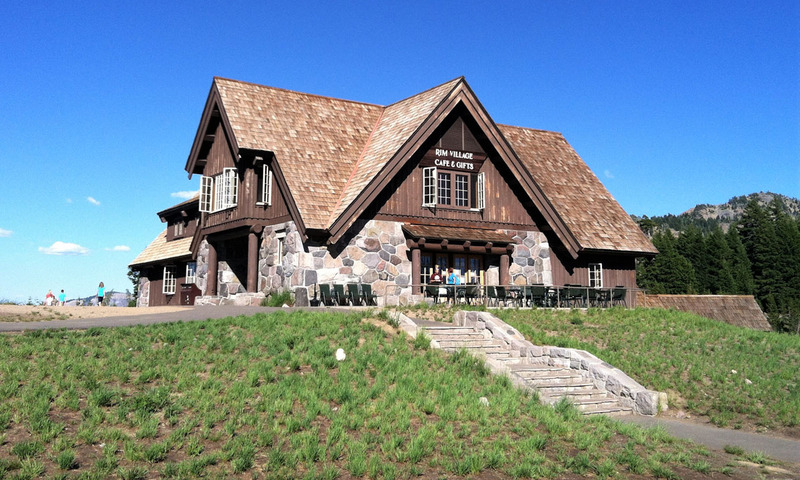 He got his grand mountain hotel in his favorite national park. The completed masterpiece stands as a testament to the talent of Underwood. Each asymmetrical level of the six story core has a chimney. The two wings are three stories each. 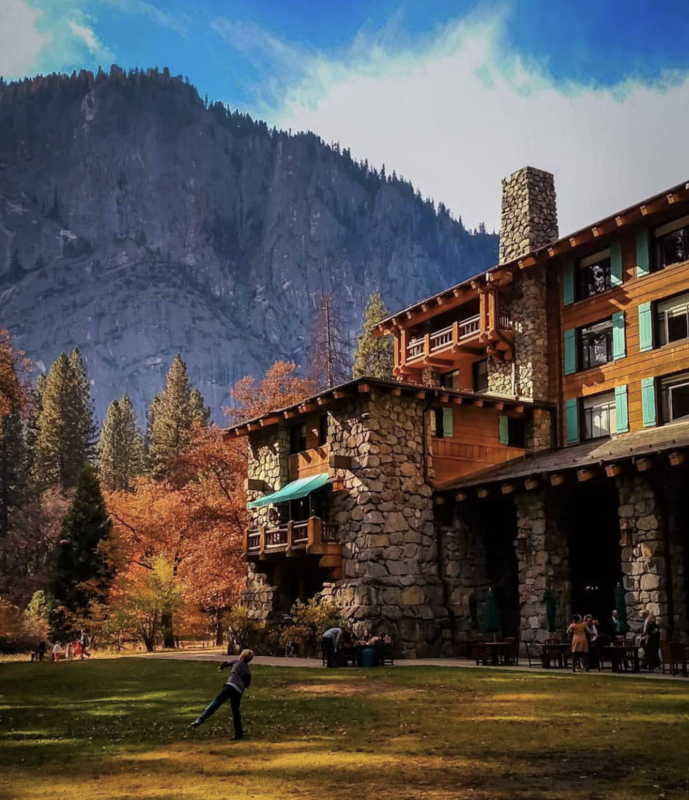 Though the hotel is very grand, it is humbled by the tall ponderosa, oak, and sequoia trees that surround it, and being located at the center of Yosemite Valley, its size is further minimized by the surrounding lofty cliffs. The president of the Great Northern Railway, Louis Hill, stepped down in 1912, from his position as president, to develop the mountain lodges of Glacier National Park. The Glacier Park Lodge located at East Glacier was the first of many mountain lodges to be built in Glacier. Since this lodge would be accessed via rail there is a train station just across the lawn. 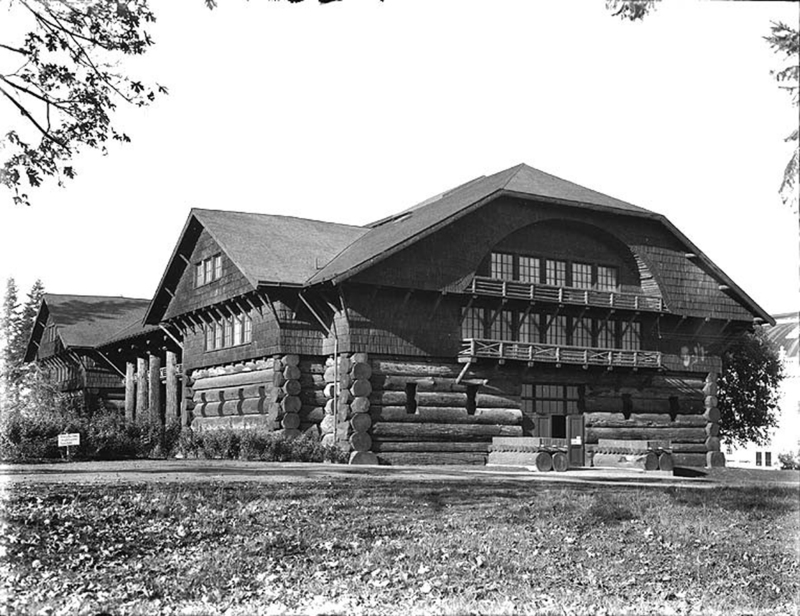 Hill was very fond of the Forestry building built in Portland Oregon for the Lewis and Clark Centennial Exposition. It was known as the world’s largest log cabin. As such, he chose to model the Glacier Park Lodge after the forestry building. The Forestry building was a long building with two cross gables at each end. There was a long two story porch along the entry side, and it featured a large atrium in the center, the length of the building. All these attributes were carried into the design of Glacier Park Lodge. Sadly, in 1964, the Forestry Building completely burnt down due to a fire caused by faulty electrical wiring. 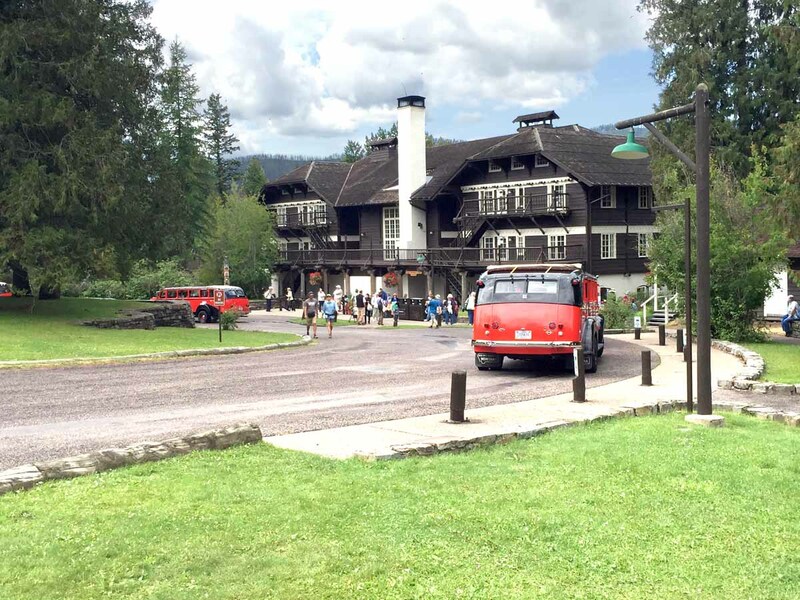 On a positive note, one could say that the Forestry Building’s form lives on as the Glacier Park Lodge. Lake McDonald Lodge in Glacier National Park (Montana) was designed by architect Kirtland Cutter and built in 1913. 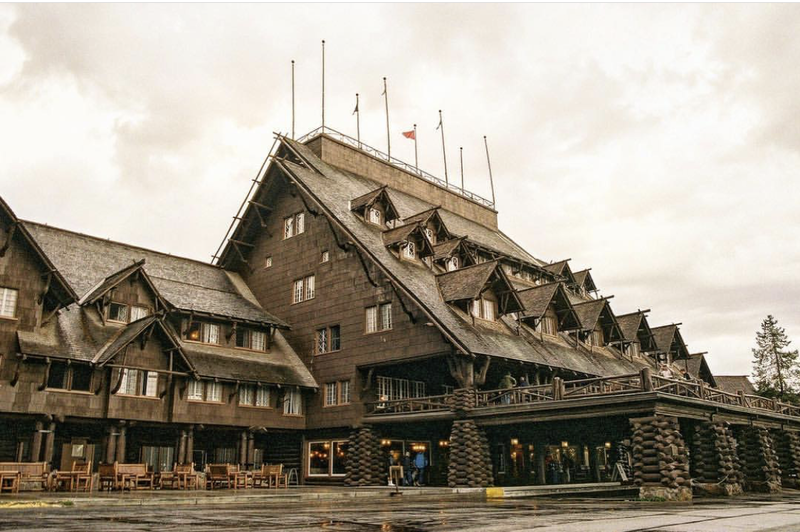 The lodge is one of the USA’s best examples of large-scale Swiss chalet architecture. It was built during a time when railroads wanted to attract tourists and create upscale destination resorts that were an equal to the extraordinary scenic areas. Many structures were influenced by the National Park Lodges. In Canada, the Jasper National Park Information Center, designed by Edmonton architect A.M. Calderon, was heavily influenced by Parkitecture. This in turn influenced other buildings in the Canadian National Park system. Built in 1914 and located in the town of Jasper, Alberta, it served as a landmark for passengers arriving on the Canadian National Railway, and still is the primary visitor contact center for visitors to the park. In 1992 it was designated a National Historic Site of Canada. Detail of the Jasper National Park Information Center in Jasper, Alberta. Decades have gone by since the “glory days” of parkitecture. National park funding is now tight and many of these beloved buildings are showing signs of age. As architect Steve Mouzon puts it, “If a building cannot be loved, then it is likely to be demolished and carted off to the landfill in only a generation or two.” Fortunately these buildings are dearly loved. Do you have a favorite work of Parkitecture? What has been your experience? 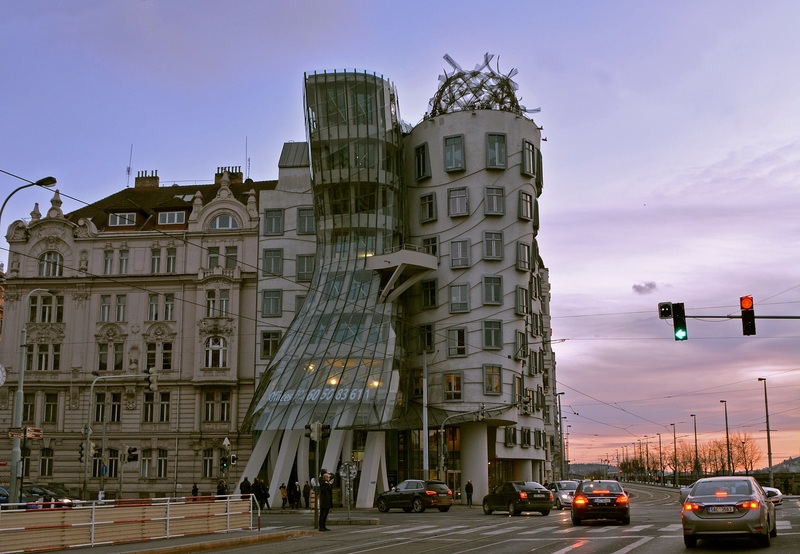 Have you visited any of these buildings and have fond memories there? Are there any others that you hope to visit? Please feel free to let us know in the comments below. For more on early mountain architecture, see Origins of Mountain Architecture in America. Hendricks Architecture, mountain architects in Sandpoint, Idaho. We’ve designed everything from small mountain cabins and beach houses, to expansive mountain lodges and estates. We’re always open to designing castles and cathedrals as well. 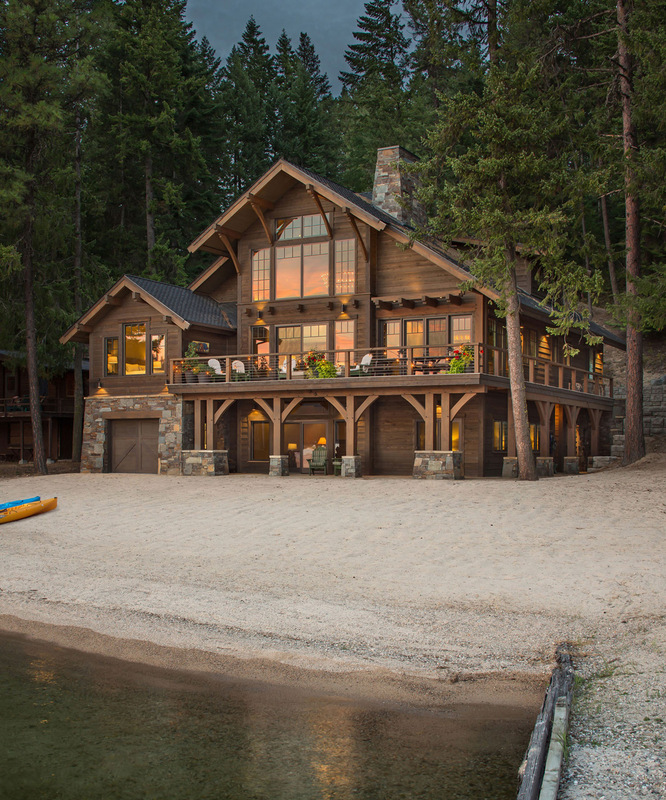 A lakefront beach cabin we designed was recently completed on the shores of Priest Lake, in Northern Idaho. Beautiful lake views abound from just about every room. The owners wanted to replace an outdated cabin that was set far off the beach. The placement and design layout of the home didn’t work for them, and wasn’t very energy efficient, so they decided to start from scratch. The Owner’s “cabin on the lake” wishlist included a rustic, yet refined look on the exterior, with cedar, stone and timbers. A connection to the outdoors, with lake views from all the major rooms, along with outdoor living spaces, was a must. The new cabin includes four bedrooms and a large game and sleeping loft. The beach level lower floor comprises of a boat garage with plenty of room for other water toy storage, as well as a family room and two bedrooms. Down below there is also a mud room and outdoor shower on the side. The main entry level has an intimate dining and kitchen, along with a master suite that includes a large tub and walk-in shower, and beautiful views across the lake. 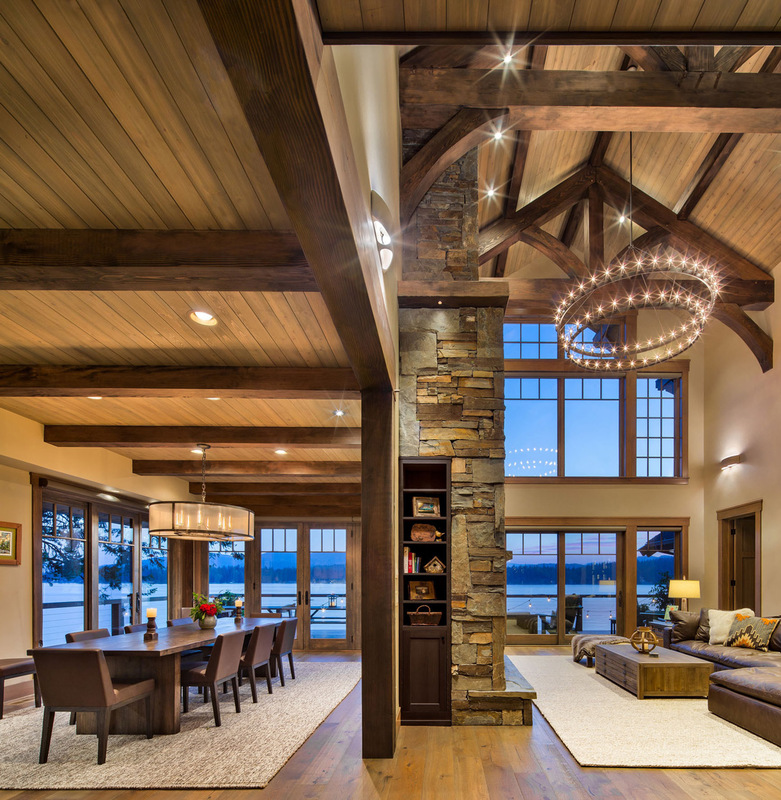 A soaring living room, with recessed bookcases and overhead timber trusses (two flanking a two-story fireplace), shares space with the upper loft. A soaring living room and loft space connect to the more intimate kitchen and dining rooms. The living room and dining room both have access to a large deck, held up by timber posts and knee braces, wrapping around to the front of the cabin. The lake views out of these rooms are breathtaking. There’s also a one-car garage on the main level. 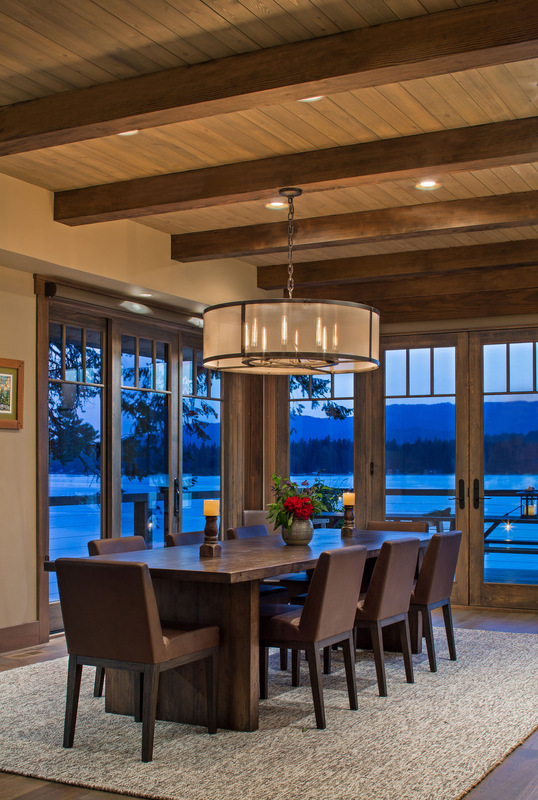 An intimate dining room and a soaring living room space both have incredible views of the lake. The cabin was designed in the Mountain Architectural style, which incorporates natural elements. The siding is beveled cedar, with stone accents. It is post and beam construction, versus a true timber frame. The windows are aluminum clad, with alder wood interiors. Part of the southern end of Priest Lake, as see from East Shore Road. 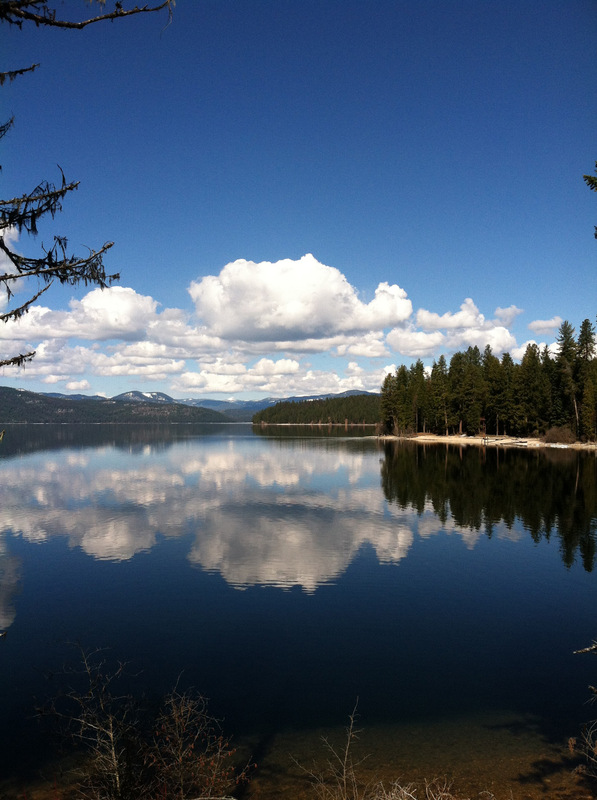 Priest Lake is in the northern panhandle of Idaho, in what is called “Lake Country”. 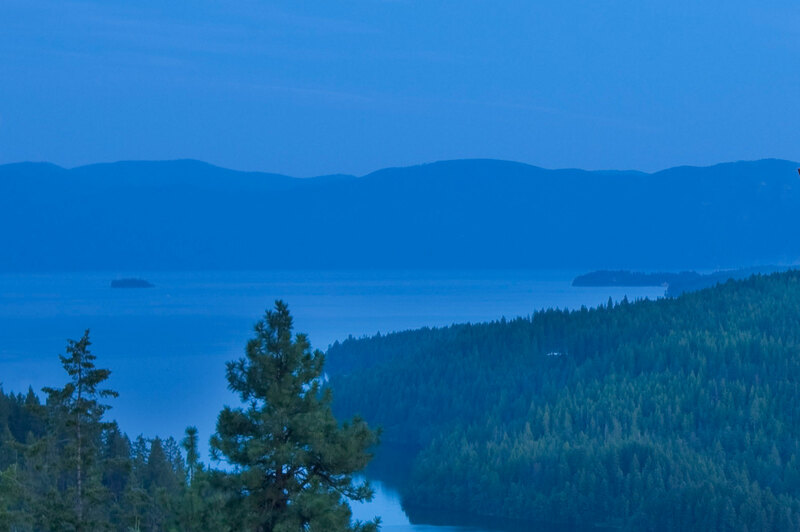 Though it’s only the 3rd largest lake, behind Lake Pend Oreille and Lake Coeur d’Alene, it’s still 26,000 acres, or about 41 square miles. All three of the lakes produce some of the biggest trout in the country, along with kokanee, bass and many others. 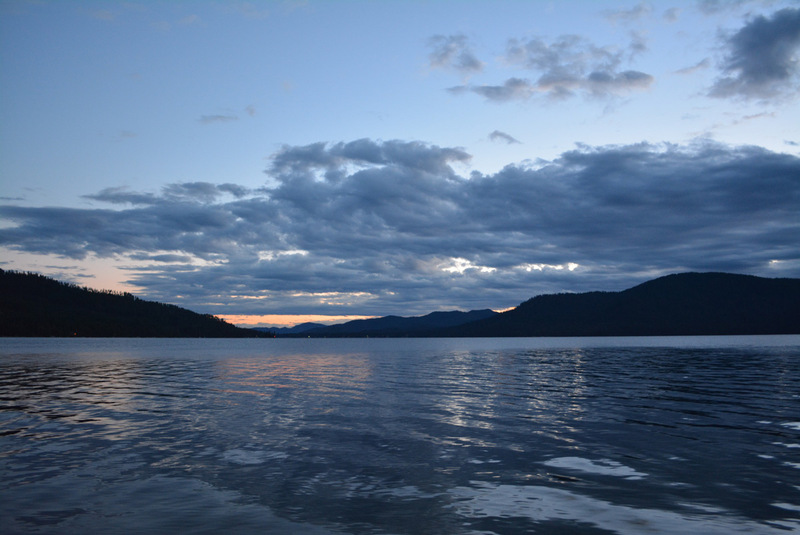 Priest Lake is the more rugged of the three, as in more forested, and is much quieter in the winter. There is also a 2.5 mile long thoroughfare at the northern end of the lake, connecting to a smaller Upper Priest Lake, which is even quieter with no cabins. Every time I drive out to Priest Lake, I’m reminded quite a bit of Huntington Lake in the Sierra Nevada mountain range in California, which is a lake where we had a family cabin when I was growing up. Except that Priest Lake is almost twenty times as big in area. Both are big in fishing, hiking and camping. Huckleberry Bay on the north side of Priest Lake. The contractor was Mike Sandau of Sandau Builders. If you ever want to build on Priest Lake, I would highly recommend using them. Special thanks to Marie Dominique Verdier, who took these beautiful photos. And of course, a big thanks to the homeowners, who were great to work with, and who I won’t name so they can keep their privacy. 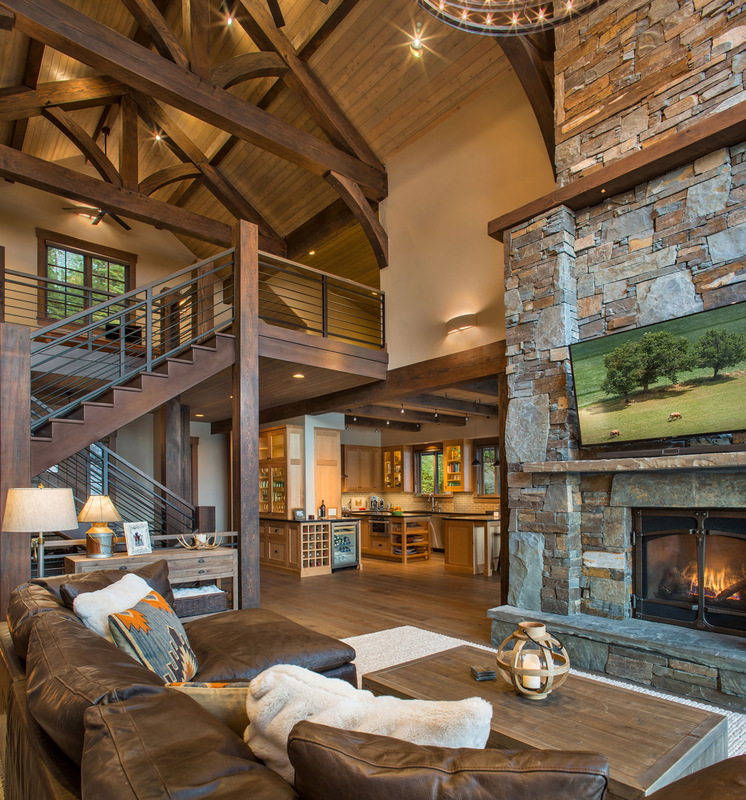 Hendricks Architecture specializes in the design of mountain style homes and cabins, and has been listed yearly among Mountain Living’s top mountain architects. We try to add a little bit of soul into each home, to reflect the personalities and wishes of the homeowners. We’ve designed all over the USA (including many at Priest Lake), and several other countries. There is architecture, and then there is creative architecture. Most architectural projects begin with a precedent, a design rooted in a defined architectural style. For us, it is often the Mountain and Arts and Crafts styles. While most architectural projects are based on some architectural style or movement, innovative and creative projects stem from the open minds of homeowners teaming with inventive architects. I have selected five recent projects from various architects that ignite my creativity. Dancing House, designed by Vlado Milunić and Frank Gehry, is located in Prague, Czech Republic. This project bends perspective and distorts the view of the built world; buildings like this reform what we think is possible. It was originally named Fred and Ginger, to emulate the famous dancers Fred Astaire and Ginger Rodgers (Fred’s on the right). 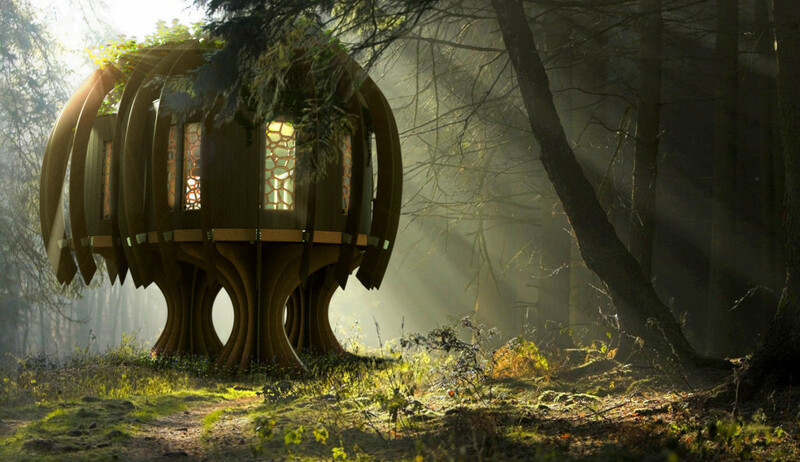 Built by the British luxury tree-house design-build firm Blue Forest, this project looks like it belongs in a sci-fi movie. The shape is inspired by a tree, but is like nothing else I have seen. It definitely begs a second look. 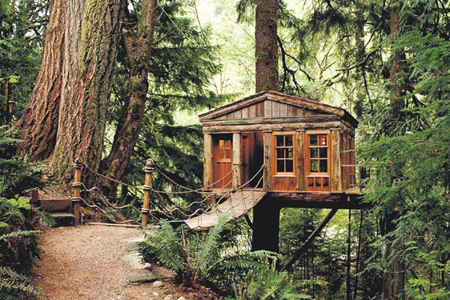 Designed and built by Pete Nelson, TreeHouse Point Bed and Breakfast near Seattle, with includes several tree-houses, sparks my childhood creativity. 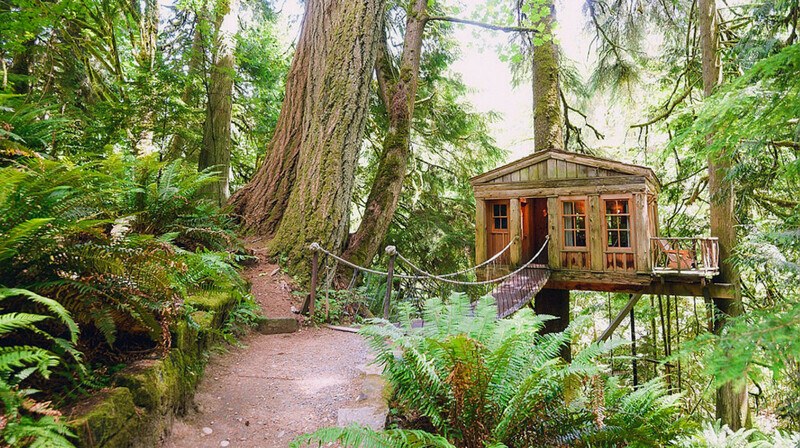 Tree-house dreams don’t end with childhood, but continue into adulthood. This project is a prime example of this. 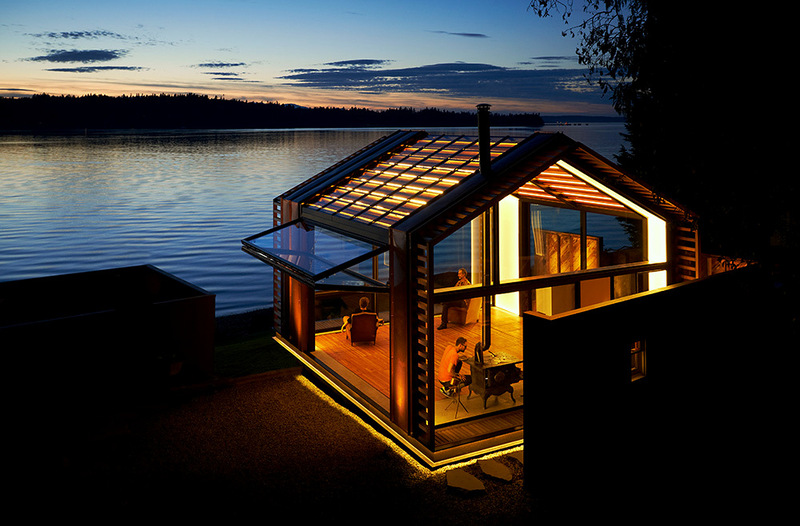 This old mid-1900’s garage in Vashon, Washington was repurposed by Graypants. While not as surreal as the previous projects, it is creative in a different way. Being able to rethink the old, and to bring the dead back to life, requires a creative mind. 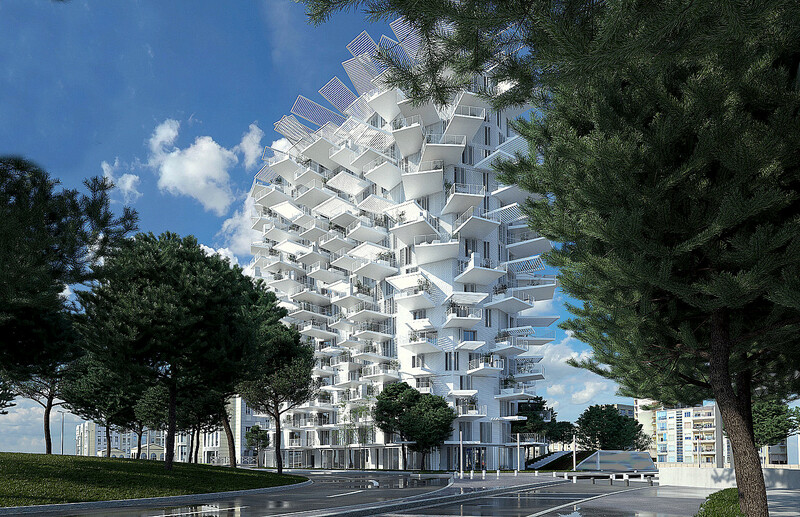 Above it the multi-purpose tower L’Arbre Blanc (White Tree) in Montpellier, France, was designed by Sou Fujimoto Architects, NLA, and OXO Architects. Inspired by the functionality of a tree, the balconies create shade and absorb sunlight. It is appreciable to look to nature for functional design inspiration; being able to do this requires a creative, problem-solving mind. These projects show me how far a little creativity can go. I am thankful for ingenuity in the design world, for architecture being pushed in a direction it has never been; for fresh ideas and new perspectives. Where does your creativity take you? As architects designing custom homes and other projects, we love hearing new ideas from clients and making them a reality. Imaginative minds produce creative architecture. Contact us here. Anyone who has children, has seen the Harry Potter films, or read the books, should be familiar with Hogwarts Castle, home of the fictional “Hogwarts School of Witchcraft and Wizardry”. Even if you haven’t, it’s still a sight to see if you like cool architecture and castles on the whimsical side. In our last post we talked about the Architecture of Hogwarts Castle and its influences, including Durham Cathedral, the City of Edinburgh (and its castle), and Gloucester Cathedral. I’m going to continue that here, and will again include associated Harry Potter filming locations. I should point out that I’ve always been drawn to castles (and cathedrals), along with their architecture and history, which, luck has it, the Harry Potter films draw from with some creative touches. No residence is more formidable than a stone-built castle that can withstand the elements for hundreds of years, and sometimes thousands of years when well kept. Some of the most formidable, in my opinion, are located in Western Europe, and I’ve been lucky enough to to tour many of these. 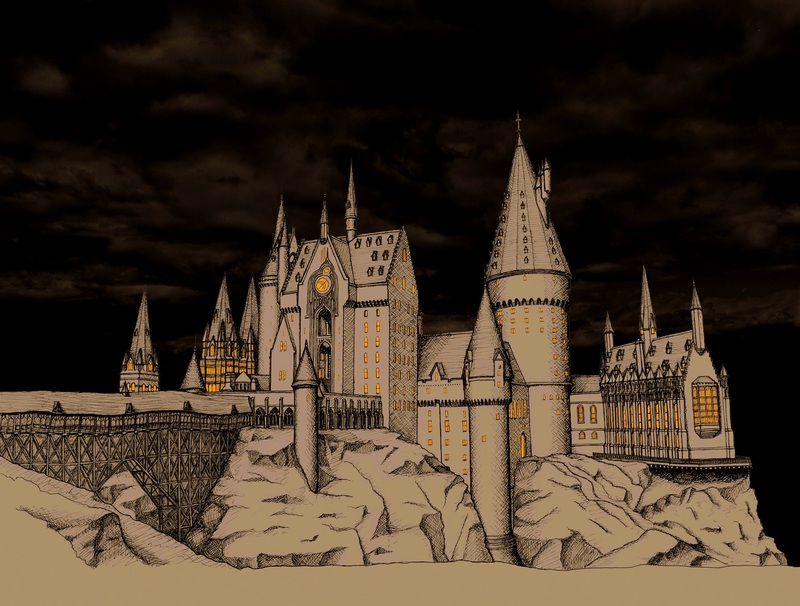 Before filming began on the Harry Potter series, production designer Stuart Craig was given the enviable job of designing the perfect castle to mimic J.K. Rowling’s vision of Hogwarts in the previous books, and the ones not yet written. The finished product was a castle model scaled down to the size of a small house, and was used in the films for every imaginable shot showing Hogwarts (when not able to film at actual locations, such as Alnwick Castle in our previous post). I visited the Hogwarts castle model and studied the drawing details on two different occasions. Westminster Abbey was one of several imposing British medieval cathedrals that Craig and his team studied before designing Hogwarts Castle. Located in London, the English and British Kings and Queens have been crowned here since 1066. 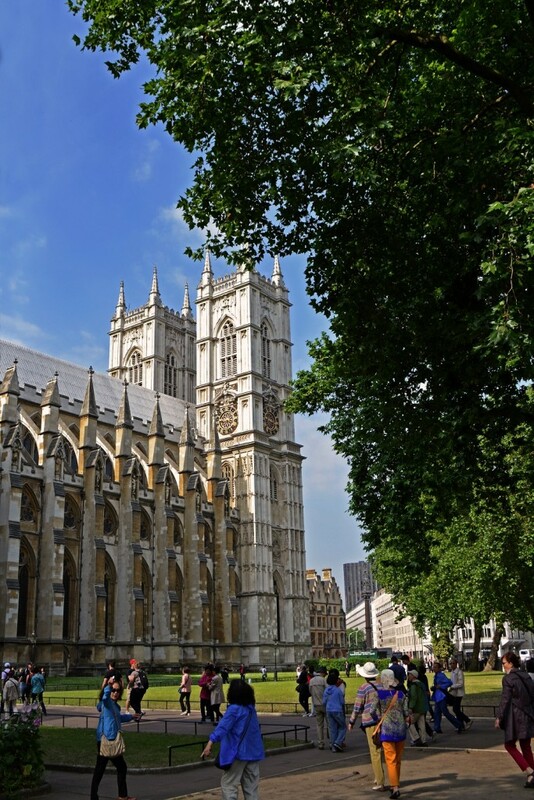 Westminster Abbey has also been the location of sixteen royal weddings, and is the burial place of some of the most famous people of all time. A church has been at the site since the 7th century, according to tradition. Around 1050 a remodel and addition began (see Old World Architecture: Doors of England for Britain’s oldest door, part of the older structure). In 1245, on the orders of Henry III, the current abbey was added onto extensively in the Gothic style, which is defined by its pointed arches, vaulted roofs, buttresses, large windows, and spires. 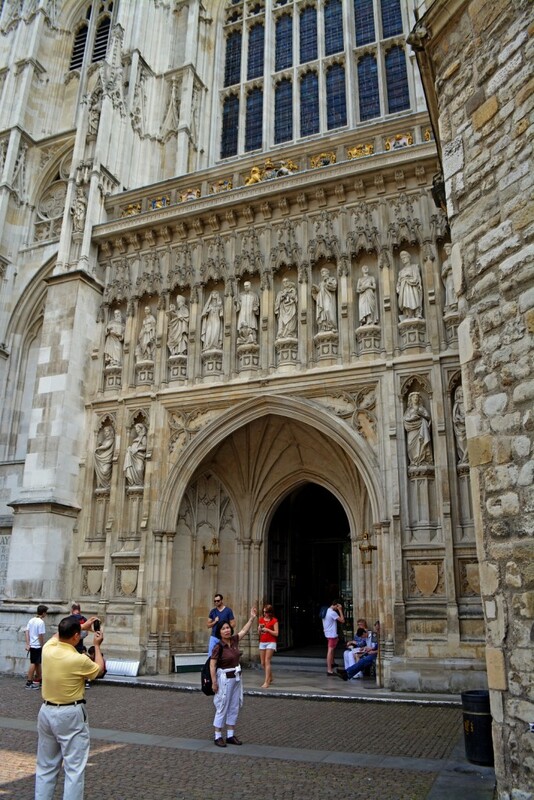 Westminster Abbey’s north entrance. The facade above the door has statues of 20th century martyrs, including Martin Luther King, fifth from the left. Henry VIII assumed control of the abbey (and granted it the status of cathedral) in 1540, during the Dissolution of the Monasteries, in order to prevent it from being destroyed. This was very convenient for him, since it was less than a half mile from his main home at the Palace of Whitehall. The Abbey’s two western towers were built between 1722 and 1745, in the Gothic Revival style, which was based off the Gothic style, and included finials, arched windows, lancet windows, and label stops (hoodmolds over the arched windows to draw water out to the sides). Westminster Abbey in London has some resemblances to Hogwarts Castle, except for the tourists. 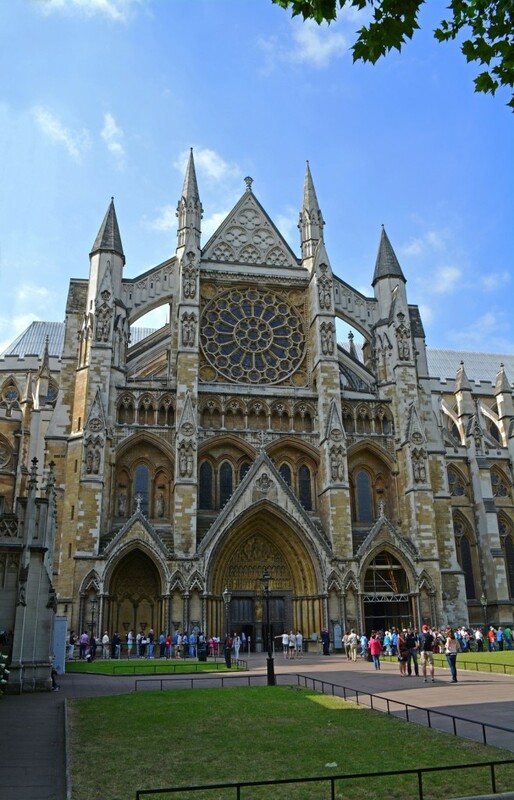 If you ever make it to London, Westminster Abbey is a “must see”, and not only for the architecture. 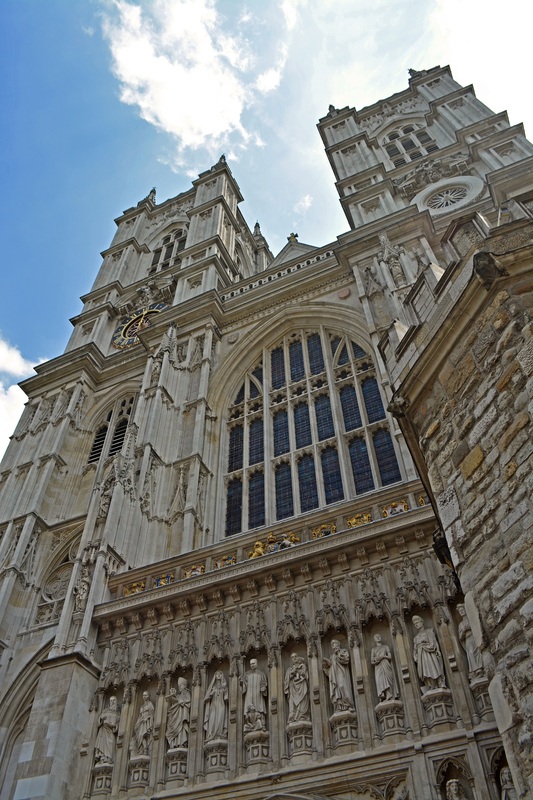 The abbey is adorned with ornate tombs of some of the most famous British people in history. Queen Elizabeth, numerous other kings and queens, Sir Isaac Newton, Charles Dickens, and composer George Frideric Handel are among those buried there. William Shakespeare, Sir Winston Churchill, Jane Austen, Laurence Olivier, Alec Guinness (probably best known as Obi-Wan Kenobi in the original Star Wars films), and Martin Luther King Jr. (who of course was not British) are among those with statues or memorials. Westminster Hall and its large timber trusses were used as inspiration in designing Hogwarts’ Great Dining Hall, the majestic hall which figures prominently in the Harry Potter films. 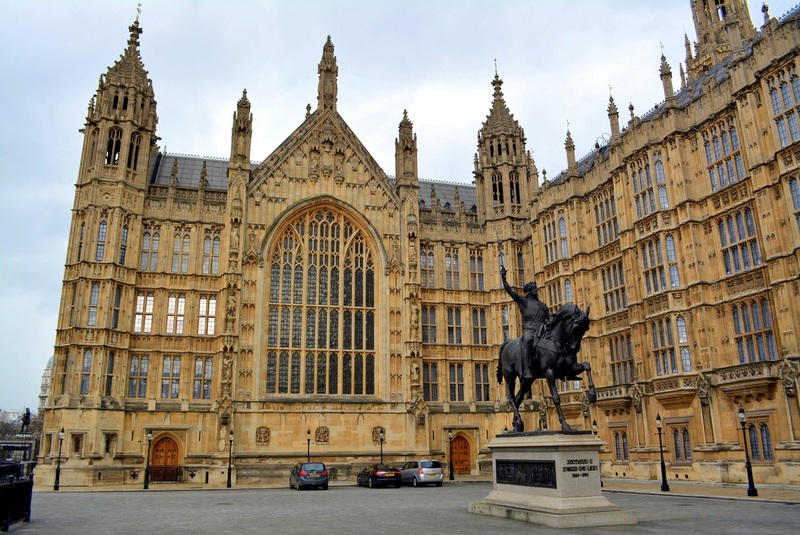 Erected in 1097, Westminster Hall was at the time the largest hall in Europe. 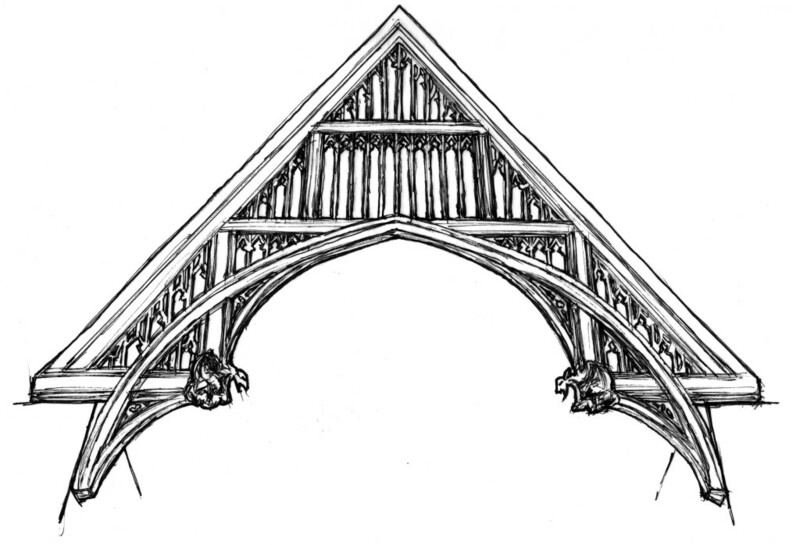 The ceiling trusses in Hogwarts Great Hall (above), were inspired by the trusses in Westminster Hall (below). Redesigned in 1393 with some very large oak hammerbeam timber trusses, Westminster Hall has the largest clear span medieval roof in England, and the largest timbered roof in Northern Europe. The Great Hall at Hogwarts was inspired by Westminster Hall in London. 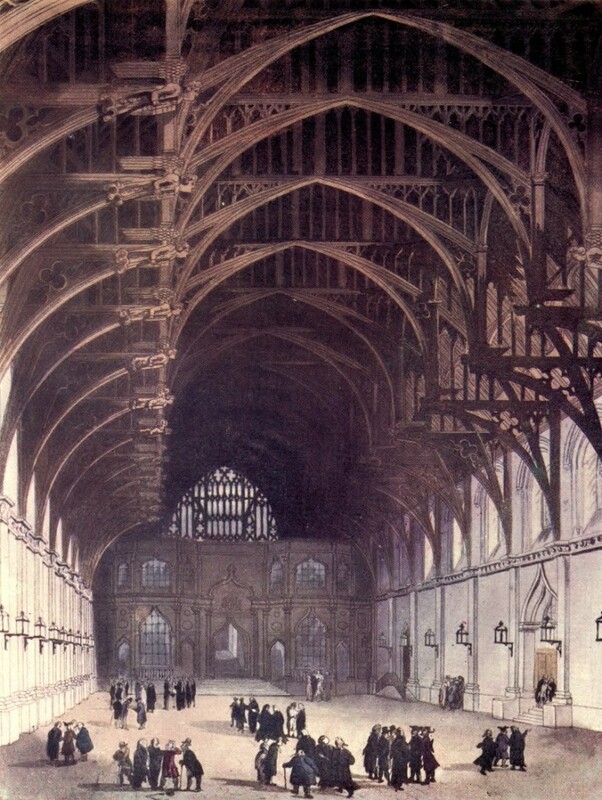 The above rendering is a Wikipedia Creative Commons 19th century drawing of the interior of Westminster Hall. I took the family to London last year, but we were unable to make it inside the hall because of a function. Below is a photo I took from the south of the exterior. Hogwarts Great Hall was inspired partly by Westminster Hall, which is located beyond the big arched window (of St. Stephens Porch). You can see the top of the window in the previous drawing. Westminster Hall is the oldest existing part of the Palace of Westminster, which was once the primary residence of the Kings of England until a fire destroyed most of it in 1512, and again in 1834. Architect Charles Barry designed the latest rendition in the Perpendicular Gothic Revival style. This style emphasized vertical lines, as well as large windows with elaborate tracery, and fan vaulting. The Palace of Westminster, as seen from the London Eye. Westminster Abbey is on right. The Palace of Westminster is now the meeting place of the two houses of Parliament of the United Kingdom, the House of Commons and the House of Lords. 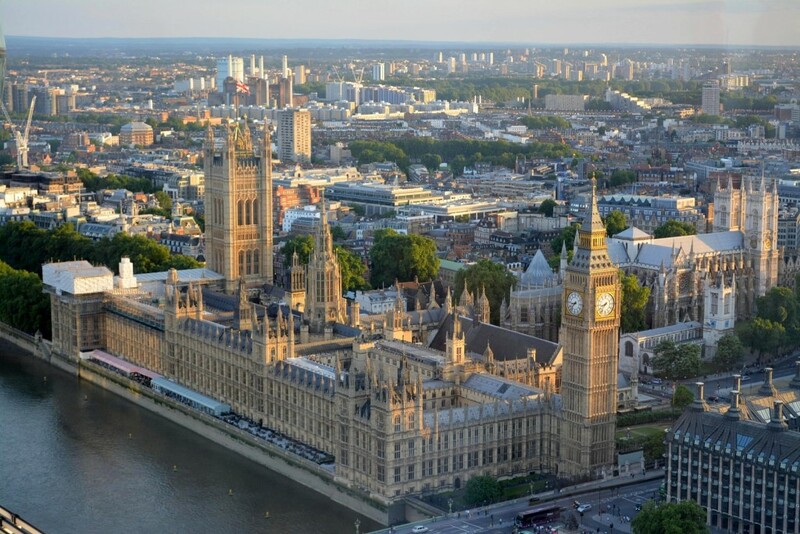 Above is a photo I took of the Palace of Westminster from the London Eye. Westminster Hall is located under the dark grey roof to the left of Big Ben. Incidentally, Big Ben is actually the massive bell, striking every hour, inside the famous clock (the largest clock in Britain) on The Elizabeth Tower. Many refer to the tower collectively as Big Ben. The London Eye is Europe’s tallest ferris wheel, and gives you great views of London, as far as the 2012 Olympic Stadium to the northeast, and Wembley Stadium to the northwest. For further inspiration in the design of Hogwarts, the filmmakers studied the architecture of Oxford, the oldest university in Britain and the English speaking world. 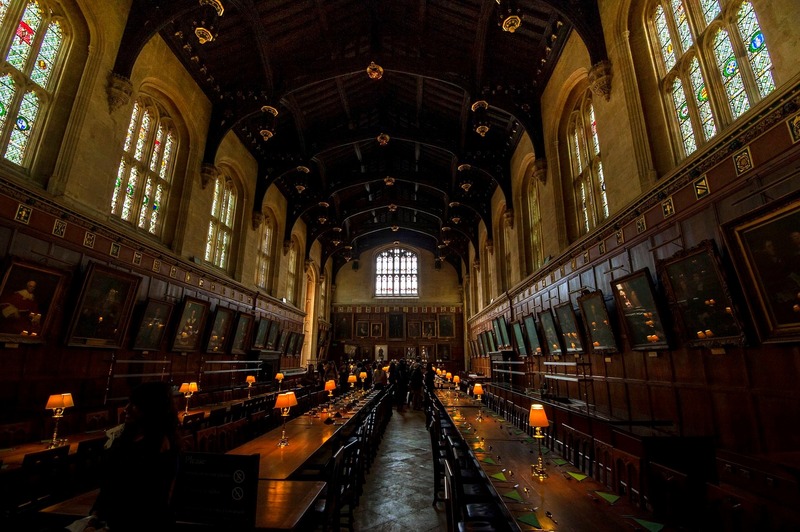 Several locations at the University of Oxford were used as Hogwarts interiors in the Harry Potter films, as well as a few exteriors. Oxford is located about 50 miles west of London. It was established around the year 1096, making it the oldest English speaking university in the world. Some famous graduates include J.R.R. Tolkien (Hobbit, Lord of the Rings), Lewis Carroll and Stephen Hawking, along with several Prime Ministers, most recently Margaret Thatcher, Tony Blair and David Cameron. Believe it or not, Hugh Grant, Dudley Moore and Kris Kristofferson were also among those graduating from Oxford. Emma Watson (Hermione Granger in the Harry Potter films), was raised in Oxfordshire, and is an honorary Oxford Fellow. Having been cast for the role when she was nine, she didn’t have much use for a university degree back then. 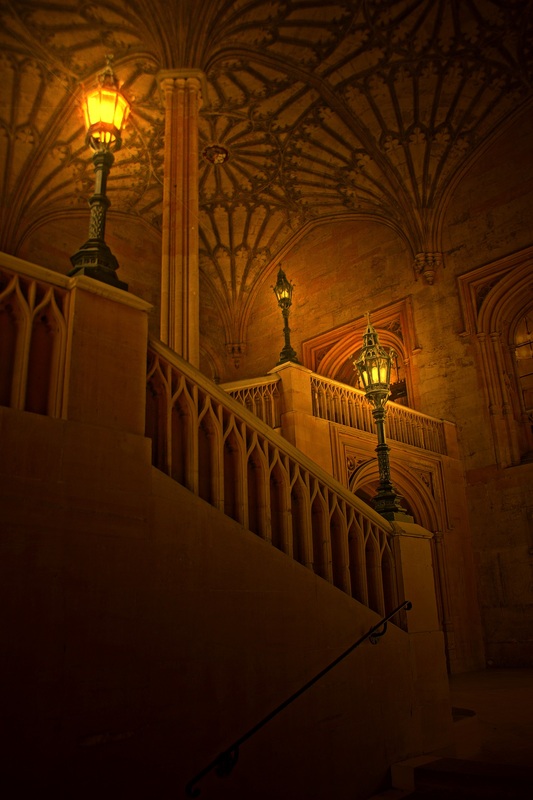 The University of Oxford’s architecture had a big influence on the architecture of Hogwarts Castle and other structures in the Harry Potter films. 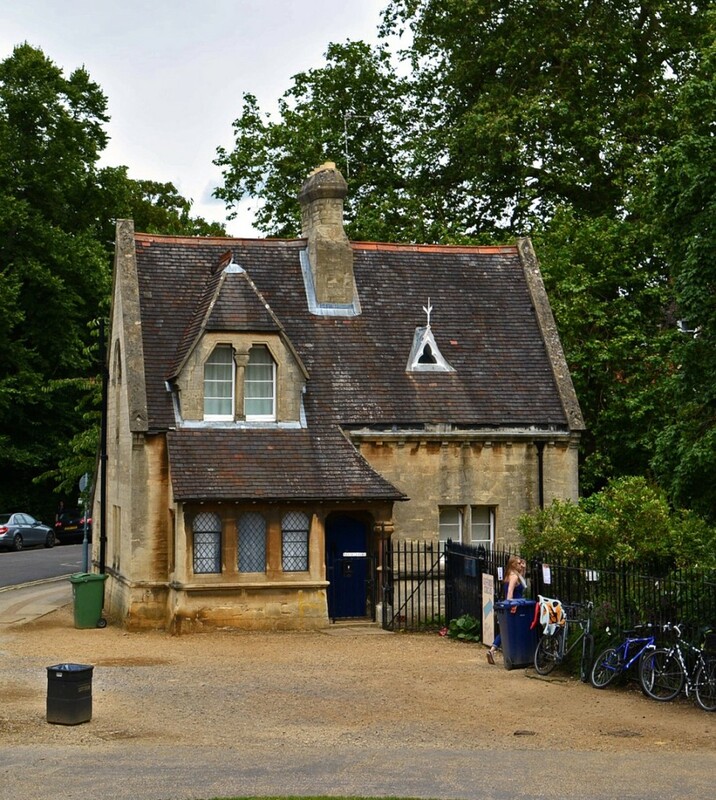 Being in existence for almost a thousand years, there are a wide variety of architectural styles at Oxford. 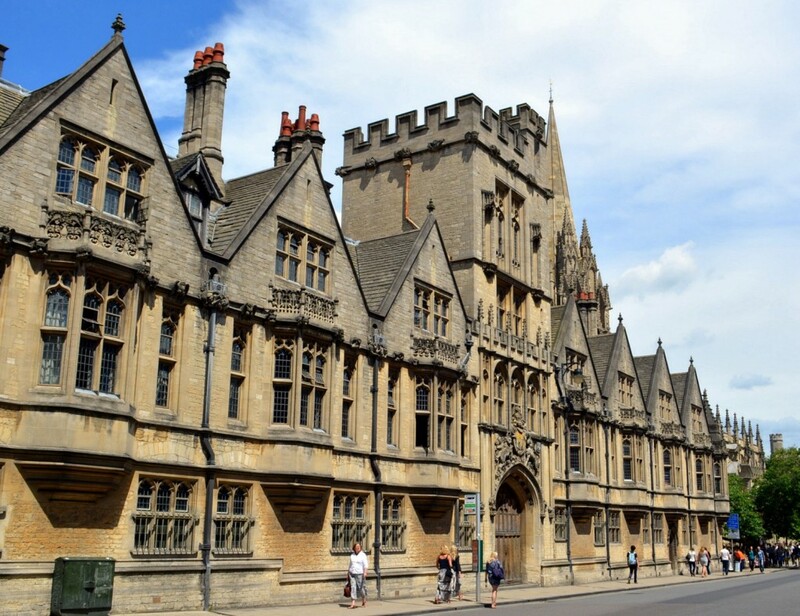 As a matter of fact, Oxford contains examples of EVERY architectural style in England’s history since the Anglo-Saxon period. I don’t want to get too far off the Hogwarts Castle tangent, but as an example, shown below are Oxford’s Saxon Tower on the left, and 27 Cornmarket Street on the right. The Saxon Tower dates back to 1040, before the Anglo-Saxons were conquered by the Normans in 1066, and is part of a church called St. Michael at the North Gate. It is the official City Church of Oxford. It’s simple, as Anglo-Saxon architecture was, but it’s almost a thousand years old! Incidentally, for a small fee you can climb the steps to the top for some good views of Oxford. The building at 27 Cornmarket Street is just across Ship Street from the Saxon Tower. Dating back to the late fourteenth century, it is a great example of the half-timber framed architecture that was owned by the wealthy, but later became more widespread into the Shakespearean times of the sixteenth century and early seventeenth. This was either originally an Inn or a home owned by a wealthy merchant, who lived on the top floors and had their business on the lower level. 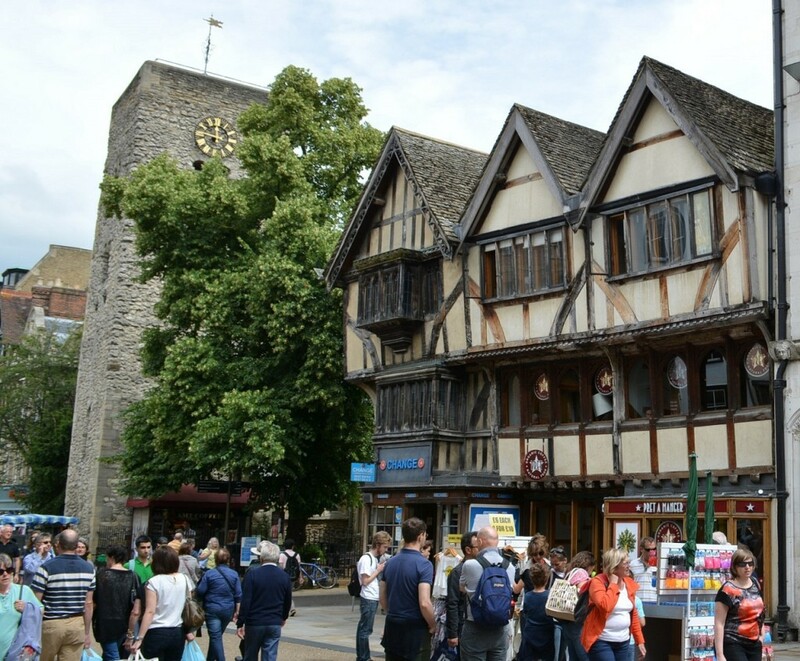 In the half-timbered style, many of the top floors hang out over each of the floors below. This was one of their methods of waterproofing, as it allowed water to run off the upper stories, rather than soaking back into the wall. They didn’t have waterproof membranes back then. For the Harry Potter fans, the half-timbered style is the style of architecture in Godric’s Hollow, where Voldemort was first defeated, and where Harry returns to visit his parent’s graves. Oxford has the biggest smorgasbord of architecture I’ve ever seen in one area. The storybook cottage shown above is likely a home once owned by an employee of the university, and possibly still is. The University of Oxford has thirty-eight different colleges. Christ Church College was designed in the Perpendicular Gothic Style, the same style as the Palace of Westminster. Christ Church’s dining hall was another inspiration for the Great Hall at Hogwarts Castle. In fact, the dimensions were kept exactly the same at 40 feet by 120 feet. The rows of tables at Christ Church are only three wide, versus four wide for the four houses (Gryffindor, Ravenclaw, Hufflepuff and Slytherin) of the Great Hall in the films. Imagine this room with the trusses and bigger arched window of Westminster Hall, and you then have the Great Hall of Hogwarts. In The Philosopher’s Stone (the first film), a staircase in one of the many buildings of Christ Church College leads the students up to the main chamber, where Professor McGonagall stands waiting for them, before entering the Great Hall for the Sorting Ceremony. Notice the fan-vaulted ceiling, an architectural style unique to England. 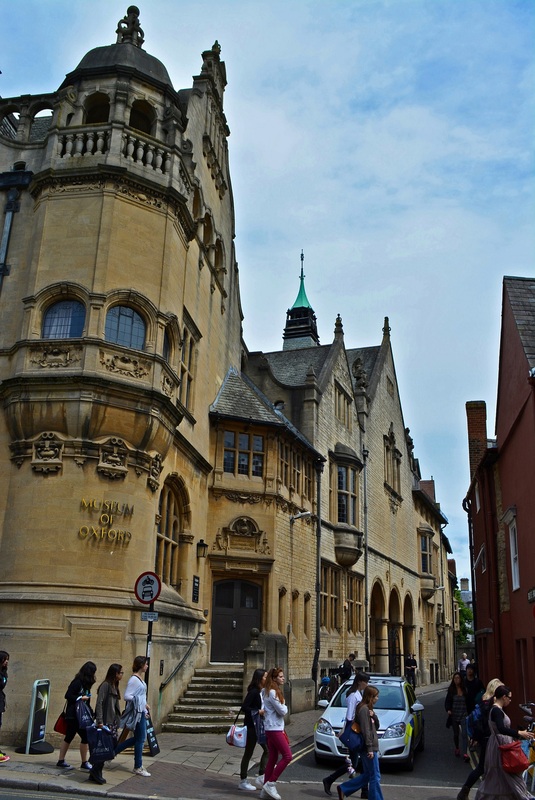 Oxford’s Bodleian Library is another example of the Perpendicular Gothic Style. 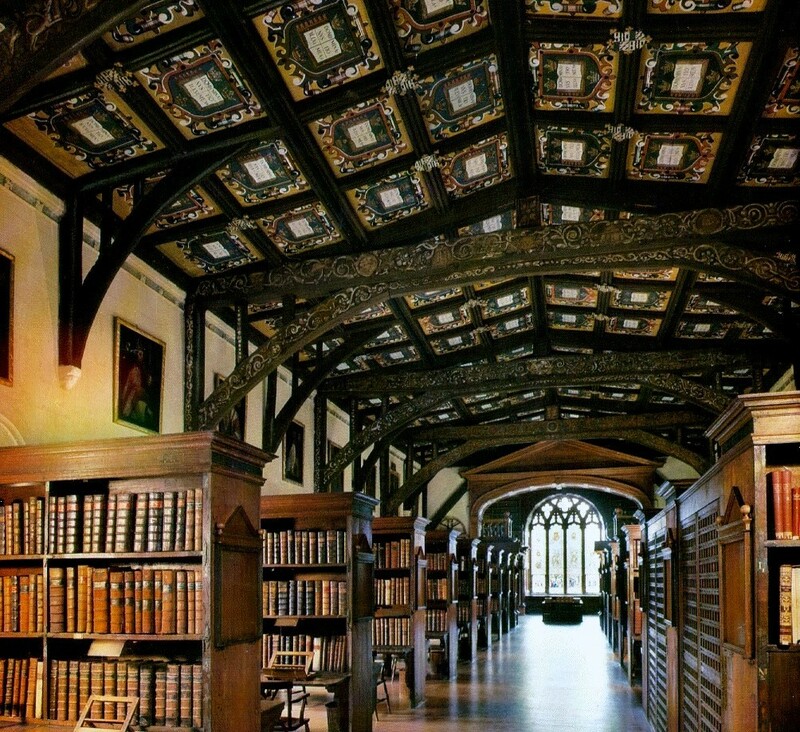 Duke Humphrey’s Library (built 1450-1480 and partially remodeled in the 16th and 17th centuries) is the oldest reading room in Bodleian Library, and was the location of the Hogwarts Castle Library. On the ground floor of the Bodleian Library is Oxford’s Divinity School (1427-1483). 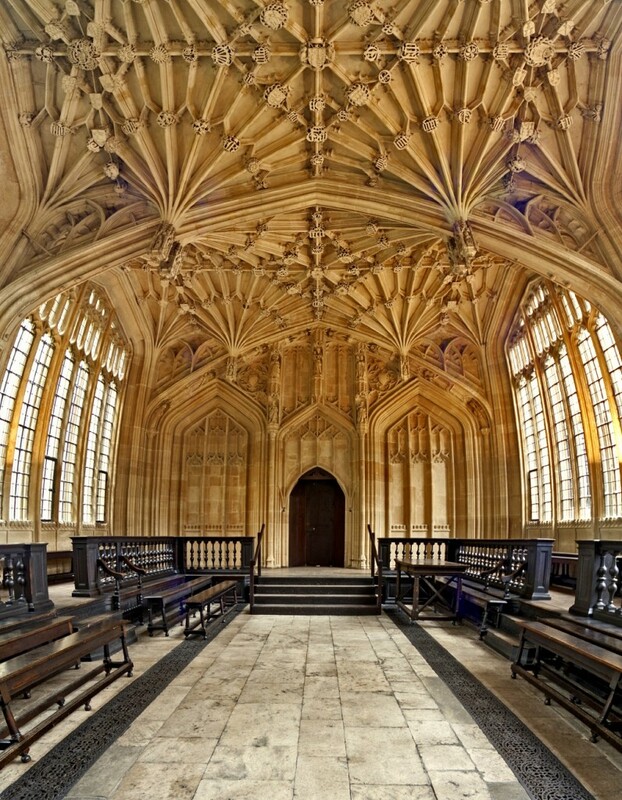 With its elaborate fan vaults and large windows, the Divinity School was used as Hogwarts’ music room, where Professor McGonagall taught the students how to dance. It was also used as the infirmary, the school hospital where Harry awakens at the end of the first film, The Philosopher’s Stone, and where Ron stays after being poisoned in the sixth film, The Half-Blood Prince. The Cloisters at Oxford’s New College were the location where Draco Malfoy attempts to attack Harry, but is intercepted by Alastar “Mad Eye” Moody, who turns Draco into a ferret. Moody is then scolded by Professor McGonagall. This occurred in Harry Potter and the Goblet of Fire. Other scenes were filmed of the students walking and meeting in the cloisters. 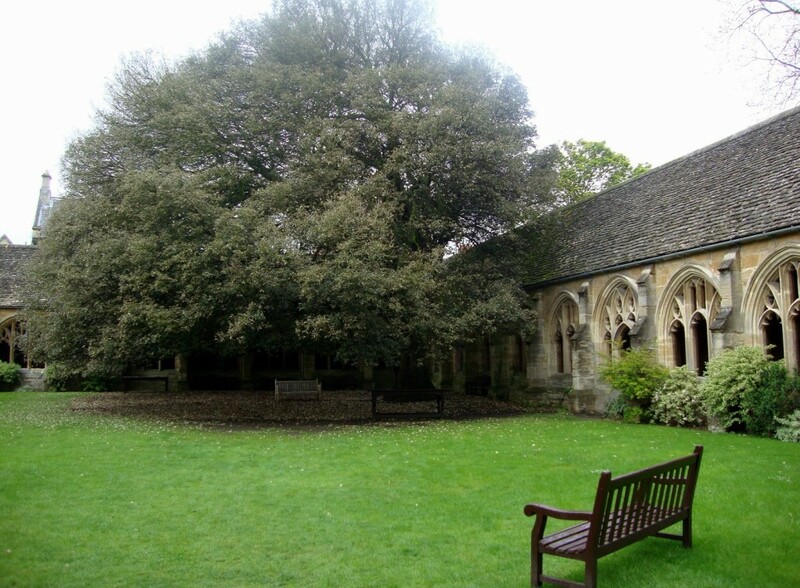 The cloisters at Oxford’s New College were used as one of the courtyards of Hogwarts Castle. Draco Malfoy was turned into a ferret in the yard here. There are other structures that have influenced the architecture of Hogwarts and other elements in the Harry Potter world, but for the sake of this getting too long, and me needing to get back to design work, I’ll continue this later. Is there anything specific you would like to see? Feel free to also shoot me questions. Hendricks Architecture has designed everything from small mountain cabins and beach houses, to expansive mountain lodges and estates. We’re always open to designing castles and cathedrals as well. We are mountain architects specializing in mountain architecture throughout North America, from lodges and lakefront homes to cabins and beach houses.